Mu Koh Surin National Park is an archipelago in the Andaman Sea located approximately 70 kilometers off the western shore next to the Thailand – Myanmar border. The Park comprises 5 major islands; namely, Koh Surin Nuea, Koh Surin Tai, Koh Khai (Koh Torinla), Koh Klang (Koh Pachumba), and Koh Ri (Koh Satok). It was proclaimed a national park on July 9, 1981, and includes islands with beautiful coral reefs in the shallows and various schools of fish of different colors. 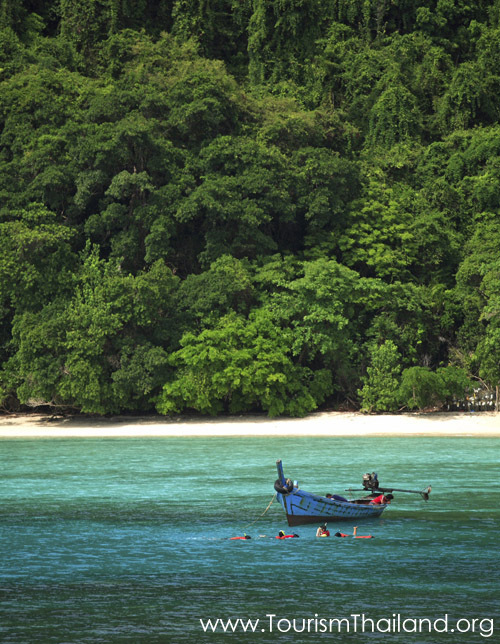 It offers ideal spots for snorkeling to admire coral reefs in the shallows, especially at Koh Torinla and Koh Pachumba. An ideal spot for scuba diving is the Richeliu Rock, 10 kilometers to the southwest of Koh Surin. This site is a fertile undersea nature habitats various kinds of fish, colorful corals, and where whale shark, the kind Giant of the Sea, is frequently encountered. The most suitable period for a visit is between November and April whereas from May to October is the period of monsoons when there are heavy rainfalls and windy wavy sea.